The present work was focused on microwave absorption and electrical properties of conducting carbon black-filled/styrene–butadiene–styrene and polyaniline-filled/styrene–butadiene–styrene prepared in a mechanical mixer. Composites containing 1.0, 4.0 and 10 wt% of carbon black were studied. 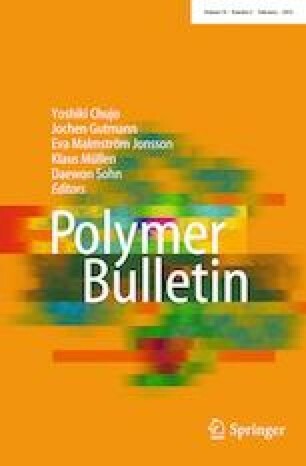 Conducting composites of polyaniline doped with dodecylbenzenesulfonic acid containing 5.0, 15, 20 and 30 wt% of doped polyaniline were also investigated. Complex permittivity measurements were obtained using the small perturbation theory for room temperature measurements carried in two cavity resonators at 2.47 and 5.0 GHz. The cavity perturbation technique is based on the changes in the resonant frequency and quality factor of the cavity due to the presence of a sample inside the cavity. The influence of filling component and composition (wt%) on complex permittivity of the materials was evaluated. As expected, both the real and imaginary parts of the permittivity increased with conductive filler content. However, composites with carbon black as filler have increased responses when compared with doped polyaniline since it needs more wt% content to get similar results. The high value of absorption coefficient and low value of skin depth were obtained for SBS/CB 10 wt%. The high value of electromagnetic interference shielding effectiveness for SBS/CB 10 wt% suggests that this composite can be used as a promising shielding electromagnetic material. The authors thank FAPEMIG, CAPES and CNPq for partially funding this work.